Printed with your logo get the very best cooler brand for your own in the Grizzly 20 Qt. Cooler. Applications include perfect personal cooler, employee gifts, safety award, promotional items. the date of original purchase. A full 20 quart capacity and 16 lbs empty. More features are a fully sealing 2" drain plug & an embossed lid ruler. The Grizzly 20 qt. Cooler holds up to 24 12 oz. cans and 5 lbs of ice. This promotional item is proudly Made in the USA Buy USA First. Delivery from date of an order for Grizzly Coolers is 3-4 weeks. Don't have time for imprinting? Blank coolers ships in 4 days. Price includes a 4CP imprint on the laminated lid decal 15 1/4" w x 8" h.
NO FACTORY SETUP CHARGE FOR A LID LOCATION IMPRINT. add a running charge of $41.25 each unit and no extra setup. Logo does require Illustrator ai, eps or pdf factory ready art. I was needing annual safety awards for plant and office workers. After a few meetings we decided on the Grizzly 20 qt. Cooler in that bright orange color. Utilized both logo areas and all the employees love them. 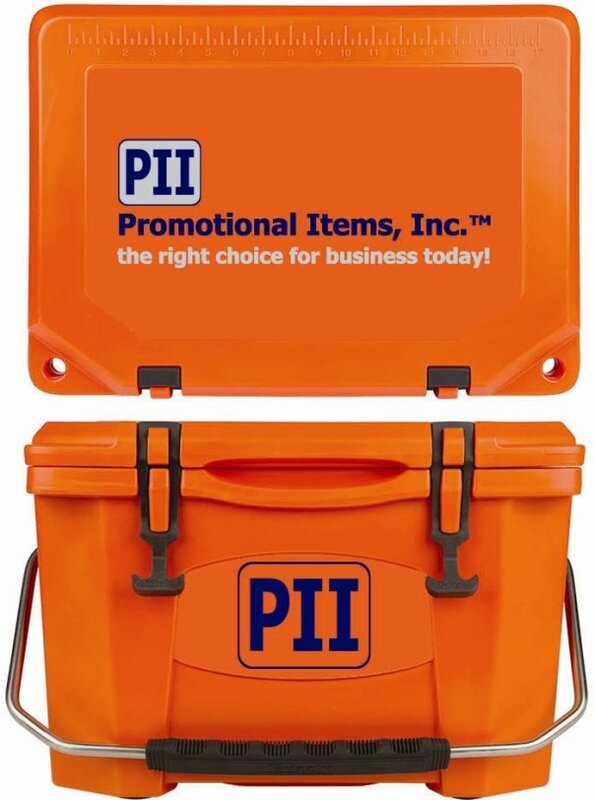 I am really pleased with the promotional coolers and especially Made in the USA. Promotional Items Inc. is definitely the company to buy all of our employee gifts. Happy and satisfied in Phoenix.